Figure 1. 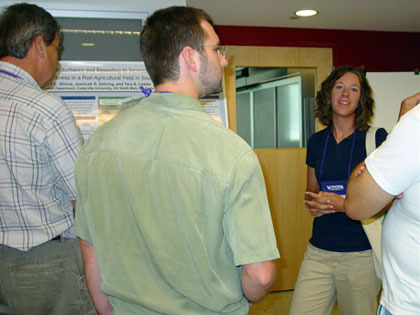 The 21st North American Prairie Conference was held at Winona State Univ. in Winona, MN on the banks of the Mississippi River as seen here from Garvin Heights west of the city on the bluffs of the river. Winona was founded in 1851 on a wide plain surrounded by steep bluffs, all formed as part of the geologic history of the Mississippi River. Figure 2. Our poster was displayed during one of the concurrent poster sessions at the conference and then judged by a roving group who listened to Jessicah Zehring' presentation of the research. Figure 3. We were privileged to chat with Dr. Don Geiger, Prof. 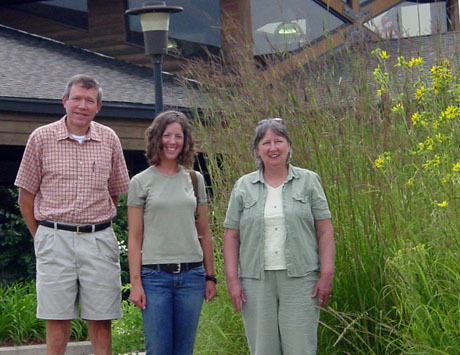 Emeritus at the University of Dayton, who is continuing his research in prairie and wetland restoration in the Dayton, Ohio area. Figure 4. Our trip afforded several stops that offered splended landscapes featuring native prairie plant species such as this one that includes Big Bluestem (Andropogon gerardii) behind Alvadell, and an unidendified Rosinweed (Silphium sp.) to her left at this Wisconsin Visitor's Center. North American Prairie Conference. 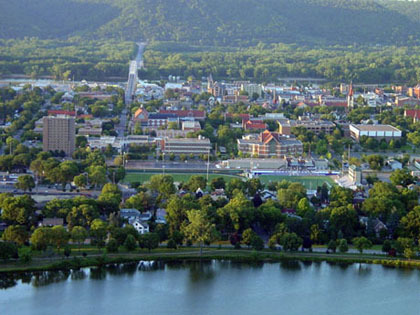 Winona State University, Winona, MN. 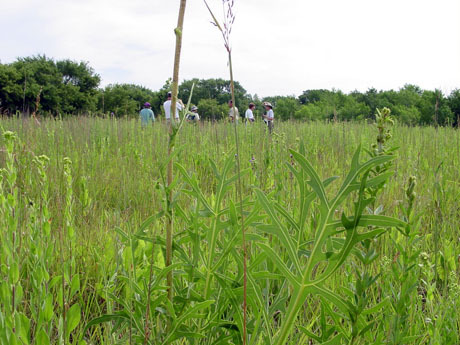 We were invited to present the results of our 2005-2007 prairie restoration research at the 21st North American Prairie Conference at Winona State University, Winona, MN (Figure 1). We chose to prepare a poster presentation (Figure 2). Our results have been summarized on the previous page. It was a blessing to travel with my wife, Alvadell whom I appreciate as my loving companion and patient partner for all the hours I spend that she cannot share; and, Jessicah Zehring who participated in both the 2005 and 2007 phases of the study. Together, we have regarded this work in restoration as a task that is an important part of our stewardship of the land and its resources entrusted to us by the Creator God as evidenced by Scripture passages such as Genesis 2:15 in which Adam was given the responsibility of serving and conserving the Garden as an example to us. 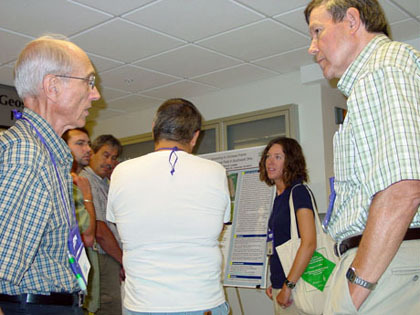 The photos on this page illustrate various opportunities we were afforded at the conference, including both oral and poster presentations on various aspects of prairie ecology, history, and restoration work; and, field trips to nearby native prairie remnants and restoration projects. Figure 5. Dr. Bruno Borsari, Department of Biology, Winona State Univ. and Chair of the 21st NAPC Steering Committee was co-leader of one of 14 field trips. He is seen here commenting on a White Wild Indigo plant, Baptisia alba. Figure 6 . 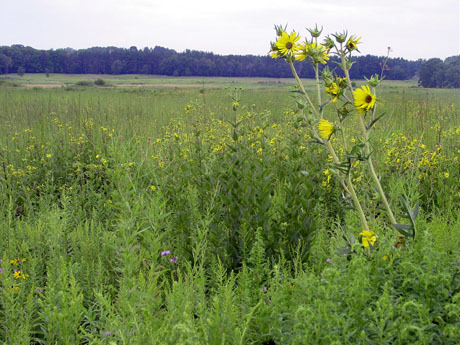 Compass Plant, Silphium laciniatum (center), Stiff Goldenrod, Oligoneuron rigidum (left), and Indian Grass, Sorghastrum nutans (emerging inflorescence against sky in center), as seen on this stop at a prairie restoration in eastern Minnesota. 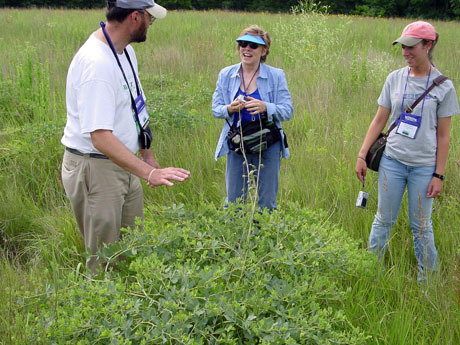 at the 60-acre Curtis Prairie, part of the Arboretum of the University of Wisconsin at Madison, and described as the world's oldest restored prairie.